Sprint has at last came up with their own "iPhone killer" through the Samsung Instinct. At first, I thought the Samsung Instinct was the counterpart of the Samsung F490 which was released in Europe but it turns out, both have different features. I think it's a really bad idea for Sprint to make their ads for the Samsung Instinct attack the iPhone. Sure, Sprint banked on all that is lacking on the iPhone such as 3G, GPS, Live TV, video recording, and the inability to quickly connect to the iTunes store, however, Sprint failed to make a comparison as to the strong points of the iPhone such as multi-touch capabilities, smooth and fast interface, Full web browsing capabilities, superior music playback capabilities. Instead of pointing out the enemy's weaker points, I think it's a better idea to show how your product is one step ahead of your competitor's by pointing out that you have better features than your rival's best features. I will be basing this preview on the Samsung F490 since it is Samsung's recent attempt at an iPhone killer. 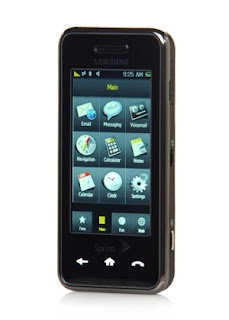 If the Instinct is anything like the Samsung F490, then it is nowhere near an iPhone killer. The Samsung F490's interface is slow and sometimes unresponsive and audio quality is nowhere near the iPhone's. It also doesn't support WiFi which a lot of tech-savvy persons are looking for. On those points alone, the Samsung Instinct will never beat the iPhone. So if the reviews will start pouring in, Sprint will probably be sorry for making the iPhone comparison attempt. Then again, Sprint did a good job of emulating Steve Jobs by making a good hype on the Samsung Instinct. They even have a release date and as far as I know, there are no reviews yet of the Samsung Instinct on the net, which means they will generate a lot of buyers on the first day of the release. I hope for Sprint's sake, the Samsung Instinct is a better improvement over the Samsung F490. Then again, there are still a lot of Sprint users who didn't go over the AT&T side during the iPhone hype and these users might welcome the Samsung Instinct with open arms. Check out this Samsung F490 Review to get a better idea of what the Samsung Instinct might be like.